As soon as I arrived at Elmfield House on Thursday afternoon Leonard ushered me eagerly into the workroom like a new mother keen to introduce her newborn baby and I found Luke slumped in a state of apparent boredom in the cream leather armchair by the window. I am pleased to report that Leonard has been entirely accurate in his descriptions of Luke as he is without doubt the most beautiful young man that I have ever seen. And I by no means state that lightly. He was slimmer than I had imagined, he appeared to be two or three years older than me at most and he was dressed very smartly in a grey shirt, black skinny jeans and shiny, square-toed leather boots. The second that I laid eyes on him I was captivated by his delicate and feminine features; his piercing dark-brown eyes, his pinched nose and feline brow, his wide mouth and perfectly ordered teeth, his pale cheeks that were flushed with a rose-pink glow that made him look slightly child-like and his loosely-curled dark hair that was almost jet black against his flawless, porcelain skin. He looked every inch like a male model from a fashion magazine and I could understand why Leonard had been keen to recruit him as a portrait model because he possessed an effeminate beauty that, although not uncommon in a man of his age, was particularly striking. “At last, the two of you finally meet!” Leonard enthused with his hands clasped excitedly together. Luke stood out of his chair and reached out his hand to introduce himself. We shook and he broke into a shy smile. I had not anticipated shyness. He was slightly taller than me, he had the warmest and most infectious smile that I had ever seen and he was very well-spoken with a mature, baritone voice that was entirely unexpected given his youthful appearance. “Now I have a dancer and a musician,” Leonard chuckled as he grinned at us from over the top of his glasses, to which I laughed and asked if he was collecting us like a pack of cigarette cards. I took off my coat and sat in the green armchair across the room so as not to distract either of the two men from their work. Watching, for once, rather than being watched. I was interested to see how Leonard was going to capture the delicate hue of Luke’s complexion and, on a more personal note, I was curious to discover whether Luke suffered from the same frustrations that I experienced during my sessions with Leonard; what did they talk about? Did Luke tire easily and require regular breaks? How did he hold a position that had him staring at the same spot on the floor for hours on end? Leonard reached behind his chair and took out his drawing board, then he tacked a blank sheet of paper to it and began sorting through the pencils and pieces of charcoal in the biscuit tin on the floor. I felt my cheeks instantly flush when Luke started to unbutton his shirt and so I offered to fetch water for everyone and made a welcome dash into the solace of the kitchen. Re-entering the workroom with the water jug, I found Luke stripped to his waist with a white linen cloth wrapped around his middle. His torso was toned but not excessively muscular and he was standing motionless in the centre of the room and staring out of the front window, looking for all the world like a marble statue. I placed the jug on the floor and quickly returned to my seat, but I couldn’t stop myself from staring at Luke, all in the interests of appreciating Leonard’s artistic vision of course! Although our introductions had been painless and Luke was very charming indeed, I felt uneasy throughout our afternoon together, not only due to Luke’s half-naked state but because the informality between Leonard and I had been noticeably disturbed by Luke’s presence and at times the workroom had the tense atmosphere of a doctor’s waiting room. It was difficult to maintain a natural conversation since Luke was facing towards the window and Leonard was concentrating intensely and so after a while I started to question the purpose of my presence at the sitting. The room had been silent for some time (aside from the scratching sound of Leonard’s pencil on the drawing board and his occasional journey over to Luke to take measurements) when, perhaps sensing my discomfort and frustration, Leonard murmured without breaking concentration from his work “I have some pictures for you”. Again without taking his eyes from the board, he reached down beside his chair and retrieved his briefcase, then searched through the contents of the briefcase and pulled out a yellow folder and offered it out to me. He apologised for the quality of the pictures inside the folder but said that he was interested to hear what I thought of them. I opened the folder, took out a handful of A4 papers and shuffled them into a manageable pile as Leonard watched with childlike anticipation from over the top of his drawing board. I expected to see the usual pencil drawings that Leonard makes of members of the public in the local library or rough sketches of children that he had encountered on the bus, but instead I found photocopies of ancient works of art. The first was a photograph of a wall fresco depicting a figure standing on the right hand side and pointing towards a smaller mummy-like figure on the left. Underneath the picture Leonard had scrawled in black ink ‘Jesus raising Lazarus from the dead, fresco, Catacomb of Callixtus, Rome, mid 3rd century’. 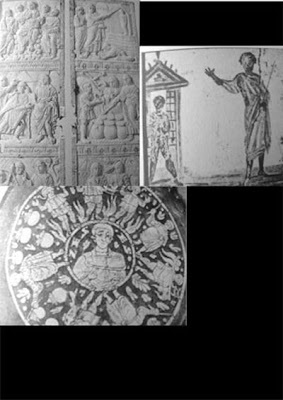 The picture on the next page was very similar to the first; a wall fresco showing a figure pointing towards a smaller figure standing in the doorway of a building. Beneath this second picture Leonard had written ‘The raising of Lazarus, fresco, Roman catacomb of Peter and Marcellinus, end of 3rd century to early 4th century’. 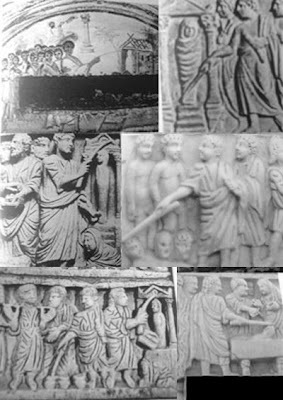 Flicking through the remaining papers I found more pictures of catacomb frescos in Rome, as well as a photograph of a glass bowl in the Metropolitan Museum of Art, a picture of the Andrews Diptych and several photographs of sarcophagi carvings from the Vatican Museum and the Musée Réattu. I looked directly up at him with a puzzled expression. “The wand?” I asked.